* You must heat tape and pipe wrap your water hose from your trailer to the hose bib and heat tape and pipe wrap the spigot and pipe all the way to the ground. If you don’t know how to do this, please check with management. * Make sure your sewer hose does not have any low spots that will hold water and freeze. Ensure that you have a “donut” in around the sewer hose. * We also recommend that you skirt your unit which will help prevent potential freezing and water leaks under your trailer this winter. Use approved skirting ONLY (ask management). Do not use cardboard boxes, scrap wood, insulation or other such materials. This campground will not look trashy. * If you haven’t already made arrangements for a large propane tank, you can call Blossman Propane on 540-832-0090. If you don’t have a large propane tank, we will assume you are using electric heat and expect you to pay an additional $5/day for electric heat unless you can show that you are using your own propane tanks (receipts required). * We highly recommend that you keep your parking places and walkways raked, swept or shoveled this fall and winter as the accumulation of leaves will cause slipping and sinking … plus you will carry the leaf trash into your units. DO NOT put down straw or hay or any other organic material in the parking spots or walkways as that only causes more sinking and slipping. 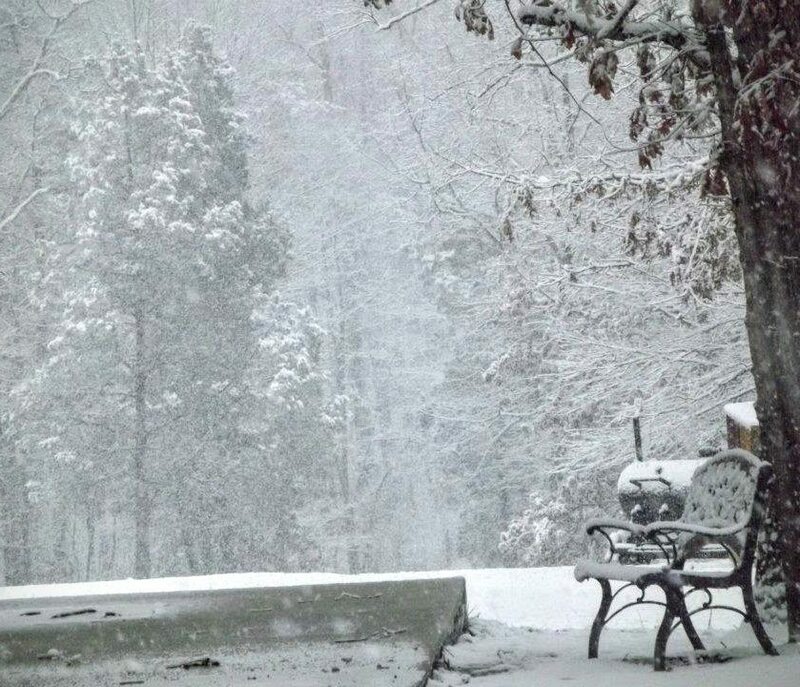 Read Below for more great and in-depth tips for successfull winterization of your RV! 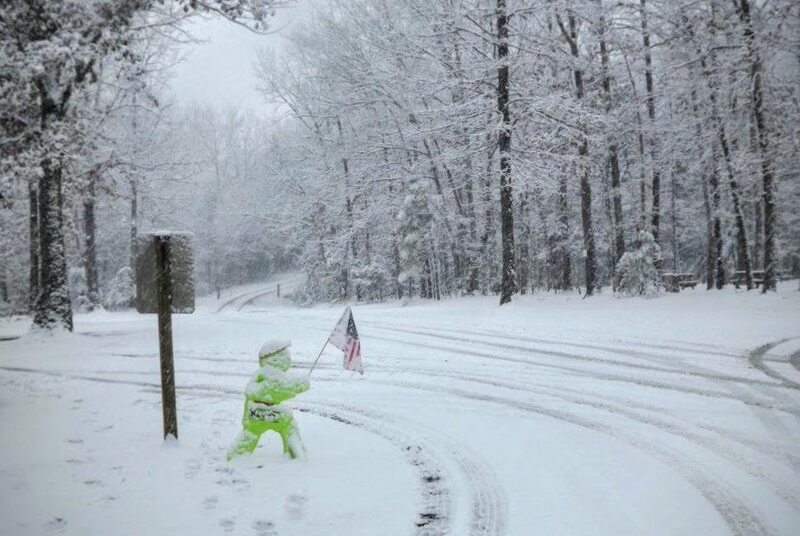 During snow falls management will endeavor to open the roads as quickly as possible. Please be patient. We will NOT shovel your driveway or walkway. This is your community. We ask that you keep your site clean and neat and that you please don’t throw down cans and bottles or other litter on the campground or on our roads. We do recycle. Call or come to the office if you want to report any problem. Thank you! 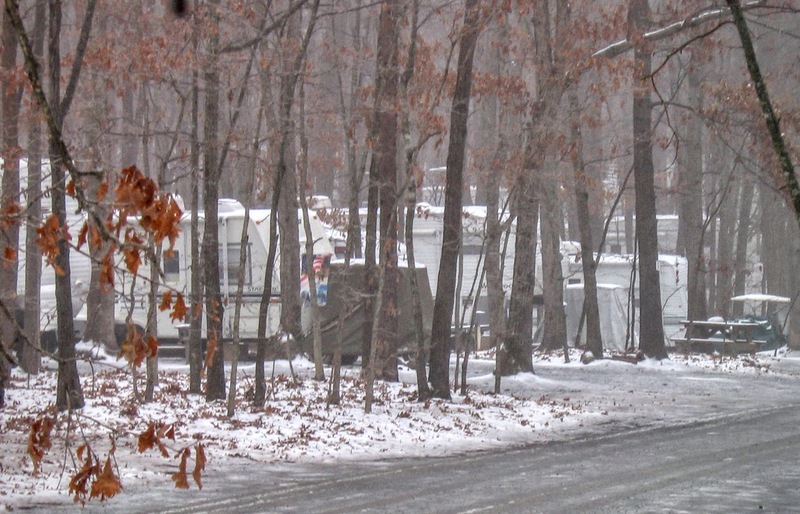 Most RVs simply weren’t designed to be used in the winter. They were built for family outings and weekend getaways during the warm months and were intended to be stored away when the weather got too chilly for outdoor picnics. Full-timers are faced with living in their traveling home, whether it is well designed for cold weather or not. Luckily, there are lots of things that you can do to make your RV more comfortable during the colder months. Let’s start by keeping that cold weather outside and the warm air in. To do this, you need to increase insulation and reduce cold air infiltration. Your windows are a great place to start. Most RV windows are single-pane and many do not seal well. A simple solution is to use shrink film on the insides of your windows. This film is readily available at home supply and hardware stores. It is a clear film that you cut to size and affix to the window frame using double-sided sticky tape. Once the film is stuck down good, you use a hair dryer to shrink it until it is smooth and tight. This not only slightly improves the R factor of the window, it makes the window airtight. This will eliminate those annoying cold drafts and also help reduce condensation on the insides of your windows. After the winter, you simply peel it off and throw it away. Getting the tape residue off the windows can be a bit of a hassle, but rubbing alcohol works well to remove the sticky stuff. It’s a great, inexpensive storm window and is relatively easy to apply. I do almost all of my windows, leaving one window at each end of the rig uncovered so that it can be opened on warmer days. Now that the windows are covered, let’s think about the roof vents. Most vents really don’t seal well and we all know that warm air rises, so what can we do to stop it? Again, there are lots of possibilities: That same shrink film can be used, or some fiberglass insulation can be cut to fit and held up with a piece of cardboard. There are also nifty little pillows that are designed to fit snugly into the vent opening to seal and insulate it. These are great, as they are easily removed when you want to have the vent open. Finally, we need to seal all those other places where cold air can enter our rig. Any compartments that open into the inside of the rig need to have good weather seals. Under the rig, there are many openings where water and gas lines enter the living area. These openings need to be sealed and some of that aerosol self-expanding foam is great for this. Alternately, foam rubber can be forced into gaps to help reduce air leaks. Finally, the entry door needs to be checked to make sure that it seals properly. Adding some inexpensive foam tape or weather-strip will really help seal those air leaks. Now that we’ve gotten the rig pretty airtight, we’ve got a new problem to deal with. Moisture from cooking, washing and just our breathing raises the humidity inside the RV. As it gets colder, this moisture condenses out on cooler inside surfaces like window frames and doors. This can lead to mold and mildew, water stains or even worse. The best way to prevent condensation is to avoid introducing excessive moisture into the air. A good practice is to always use the range hood vent when cooking and the bathroom vent when showering. This will draw most of that moisture out of the rig. It may be necessary to keep a roof vent open slightly to provide some ventilation and keep condensation in check. Insulating exposed surfaces that tend to collect moisture will also help. A small dehumidifier or some of those little tubs of desiccant crystals may be necessary, depending on the RV and how many are living in it. This discussion of condensation brings up a related subject… the method of heating that you use in your RV. When propane is burned, it releases combustion byproducts and one of those byproducts is a surprisingly large quantity of water vapor! Most standard RV furnaces are vented to the outside of the rig and will not add any moisture to the inside air. This is not true of any unvented propane heater, including popular catalytic heaters. Using your stovetop burners also adds moisture to the inside air. If you intend to heat your rig using an unvented propane heater, you will have to provide a larger amount of ventilation to remove the additional moisture added to your air. Most unvented heaters are pretty nice for milder climates and are great for taking that morning chill off. Using them as your primary source of heat in really cold weather can prove to be a challenge because of the potential for condensation problems. Many folks choose to use portable electric heaters to heat their rig. This method of heating doesn’t add condensation to the air and depending on the cost of propane may actually be slightly cheaper to run. Great care must be taken to not overload the wiring in your RV or the electrical system in the campground. Most parks will either put you on an electric meter or charge extra for electric heat. Use only UL approved heaters and keep combustibles away. Now that we’re warm, draft free and hopefully dry inside, let’s deal with the stuff outside your rig. The first thing we need to do is keep your fresh water hose from freezing. If you are traveling a lot, simply use the hose to fill your freshwater tank and then disconnect it each night. If you are parked for a longer period, consider heat taping and insulating your water hose. Standard 110v heat tape can be wrapped in a spiral along the length of the hose and then covered with either round foam insulation or fiberglass batting wrapped with tape. Don’t forget to wrap the faucet to protect it and add a pad of insulation where the hose connects to your RV. In moderately cold weather, this should keep your water flowing. If it gets extremely cold (below zero), it may still be necessary to let a faucet drip overnight. Sewer lines need special attention in sub-freezing weather too. It’s necessary to support the hose and provide a continuous slope from the RV sewer connection to the park sewer hookup. That way, water will drain from the hose and not create an ice plug at the low point. Alternately, you can use a straight section of thin wall PVC sewer pipe and the necessary fittings to complete your sewer hookup. The PVC will stand up to cold temperatures better than your plastic hose and is fairly inexpensive. Depending on your RV’s design, you may need to take extra steps to protect your fresh water and holding tanks from freezing. Tank insulation for exposed holding tanks can be fabricated from fiberglass insulation and light plywood… just build a small lightweight box around the tank and line it with fiberglass. A small electric light bulb can be used to provide a safe source of heat. For rigs with enclosed tanks, it’s often enough to provide some source of heat in the tank compartment and small electric bulbs can be used here as well. If you are too mobile for such solutions, then you should look into special heating pads designed for RV holding tanks. They can be purchased from many RV parts dealers or camping catalogs and will allow you to use the holding tanks as you normally would with no fear of freeze ups. Alternately, many Rv-ers who travel in the winter simply minimize use of the holding tanks and keep plenty of RV antifreeze handy to treat them. 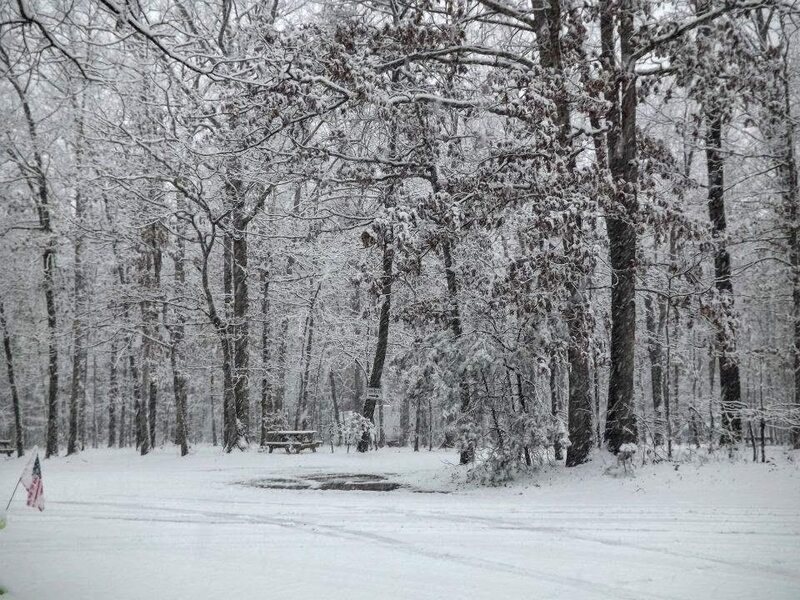 We hope these winterization tips and campground instructions are helpful! Stay warm out there campers!